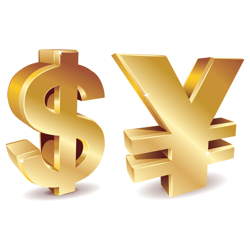 The dollar continues to grow in strength against the yen and Australian dollar, however, it did see a small pullback against the euro yesterday. Having said that, the euro has weakened in overnight trading as investors position themselves in anticipation of today's Eurozone growth figures. If extra stimulus becomes more likely, the euro may slump even further. The euro has managed to maintain some strength against the dollar, remaining above support after some choppy volatility as traders wait for this week's important US data, especially in the labour market. We will see Initial Jobless Claims, the Labour Turnover survey and Job Openings on Thursday, plus October Retail Sales on Friday. The euro/dollar exchange rate weakened overnight as the dollar strengthened once again. The pair is currently trading at $1.2463, some 35 points off yesterday's high. The dollar also gained ground against the yen after news broke that a planned sales tax hike in Japan could be delayed. The dollar maintained its position against the euro as investors looked to consolidate the strong rally seen since the Bank of Japan unexpectedly expanded its monetary base. The trend is still to the upside for the dollar, but CFD trading investors will want to be careful that the market doesn't get too overbought. The dollar depreciated overnight as US Treasury yields took a hit due to the weaker than expected jobs figure released on Friday. The EUR/USD market has rallied up to $1.2480 and it seems sensible that traders have taken some profits after holding large long dollar positions.